Hawaiian Falls Waco, the largest waterpark in central Texas, approached Armstrong Steel about quickly designing, engineering, and delivering a metal building for use as a food pavilion. Hawaiian Falls Waco has the areas first football field-sized water pool, two, six-story slide complexes, raft rides, and tube slides. DENVER –The newest addition to the five waterpark chain, which has 4 other locations in the Dallas-Fort Worth area, recently contracted Armstrong Steel to assist them in their $6.7 million dollar renovation. Armstrong Steel was happy to design, engineer, and deliver steel for their new waterpark. They shopped and compared many other steel building companies, but Armstrong Steel’s affordable pricing and high quality product blew the competition out of the water. In fact, everyone other quote came in at roughly double what Armstrong Steel quoted. Hawaiian Falls came to Armstrong Steel in the midst of their renovation. They wanted a durable structure that could withstand the elements. Steel was the obvious choice because it doesn’t warp, expand, contract, absorb water, feed termites, rust, catch fire or become a breeding ground for fungus; which makes it an ideal choice for a water park. They also had a very specific deadline to meet. Hawaiian Falls needed this structure to be delivered as fast as possible so they would have enough time to complete construction before their grand opening, and they knew they could trust Armstrong Steel. "Timing was an extremely important factor for us and we knew no one in America could get a steel building on site quicker than Armstrong Steel - so the choice was easy. We needed an open structure to use for a food pavilion at our waterpark in Waco, Texas. Armstrong Steel came through and got us our building in time for our Grand Opening ceremony,” says Adam J project manager for Hawaiian Falls Waco. “The quality of the building blew us away - especially considering they had the lowest price. Literally, they came in at about half the cost of everyone else. We expected it to be easy to erect but, wow! It was a breeze! The quality of the building was beyond anything we anticipated and the pre-galvanized secondary framing was impressive. With all of the unscrupulous steel building companies out there today, we're glad we chose Armstrong Steel because we got what we paid for and THEN some AND they came through in a pinch!” said Adam Jordan, project manager for Hawaiian Falls Waco, Texas location. Delivery is never an issue for Armstrong Steel. Armstrong’s in house engineering department allows for quick and efficient designing, detailing, and engineer certification of your building so you get exactly what you want, when you need it. The added benefit of pre-engineered metal buildings is the time you save during construction. Armstrong Steel Buildings come complete with detailed assembly instructions, an erection manual, wet stamped engineer certified blueprints and all the parts are numbered to correspond with the drawings. This allows a small crew to quickly erect and put the finishing touches on an Armstrong Building in mere weeks instead of taking months to construct a comparable building made from traditional materials. "As promised, Armstrong Steel came through and delivered the building on time and we made sure it went up without a hitch well before Hawaiian Falls grand opening on May 28th 2012. The Waco branch of Hawaiian Falls experienced a successful opening and an immensely successful season drawing 145,000 visitors! 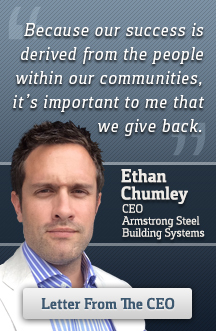 We're proud to have been a part of it all," says Ethan Chumley, President of Armstrong Steel. Armstrong Steel was delighted to be a part of Hawaiian Falls Waco’s reconstruction and is now the go to company for any other additions they may require. Dave Busch, Hawaiian Falls CEO said he will meet with city officials soon to propose some ideas, including more large-scale and small-scale water features, live entertainment, ropes courses and zip lines.